TPC Overall Rank: #223 out of 2933 rides. In User Top 10: 137 times. User Tracker Count: 531 times. 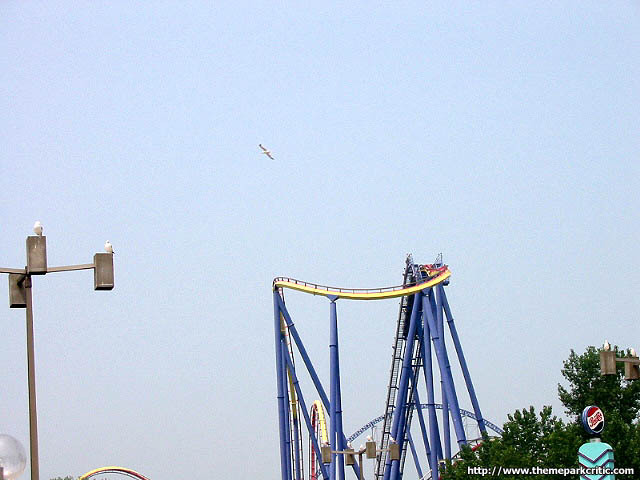 Cedar point fan, I am ready to be screwed: Mantis is... well to be honest, it met my expectations. I was expecting a run-of-the-mill coaster (inversions galore; decent-heightened first drop), except a standee. 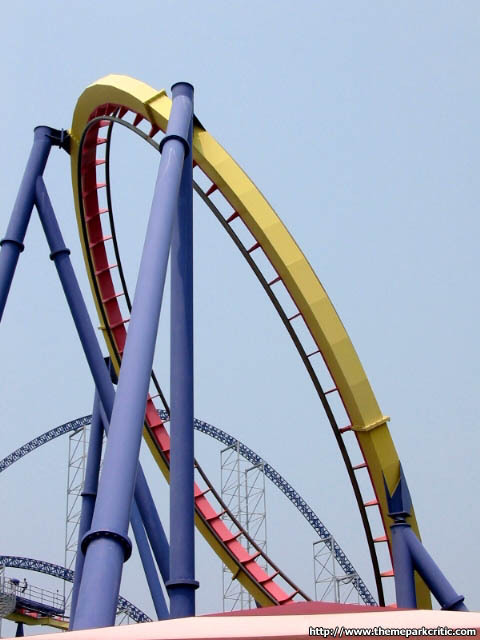 Alright call me a spazz, but I was actually intimidated by this coaster. I have never stood up on a ride but to my surprise, it felt... dare I say... the exact same? Except worse. Standees are not my thing on several reasons: the adjustment of your seat; the feeling in your legs; and your head is playing ping-pong with the OTS restraints. I love its logo and I like the color choice, but unfortunately, that is where the praise ends. Mantis, I felt stung! My first Stand up roller coaster. I was impressed. It made my legs feel kinda weird and i was kinda uncomfortable but i thought it was pretty cool. 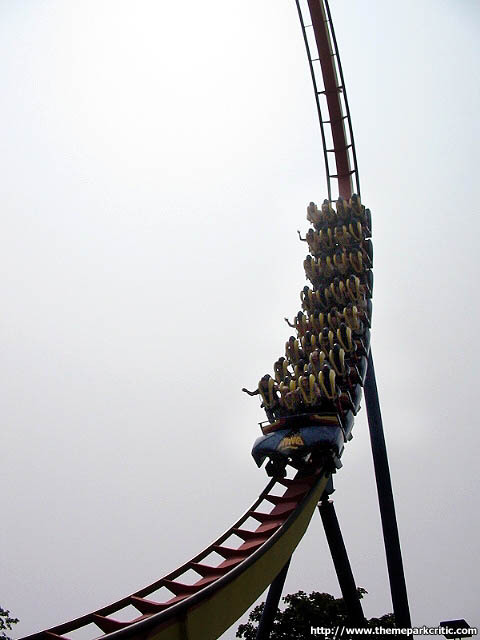 There is nothing special about Mantis, just an ordinary stand-up with some inversions, the usual drop, and a water factor. This was the first stand up I rode and while it didn't really let me down, I was not prepared for the head bashing you get after the MCBR. I was kind of upset as I expected this one to be one I would re-ride over and over again. I just can't handle the beating you get on the second half of the ride. Overall, it's a fun ride but the re-ride factor is low. I liked the first couple times i rode it. the only thing was that it hurt my legs. Maybe because im just 5'5 feet tall but it would have been better other then that. Mantis, for a stand-up coaster is actually really good. Built back in 1996, it took several stand-up records. Unfortunately, that covers almost all of Mantis' problems. 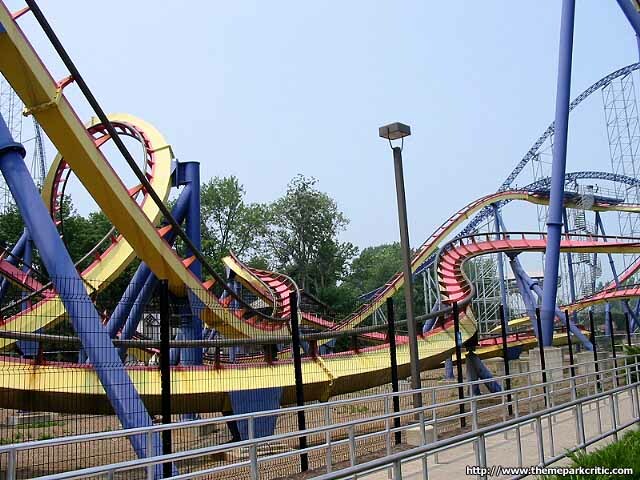 It was built to break records (which were broken again soon after), but not to consistantly provide quality rides. That aside, Mantis is full of great elements. 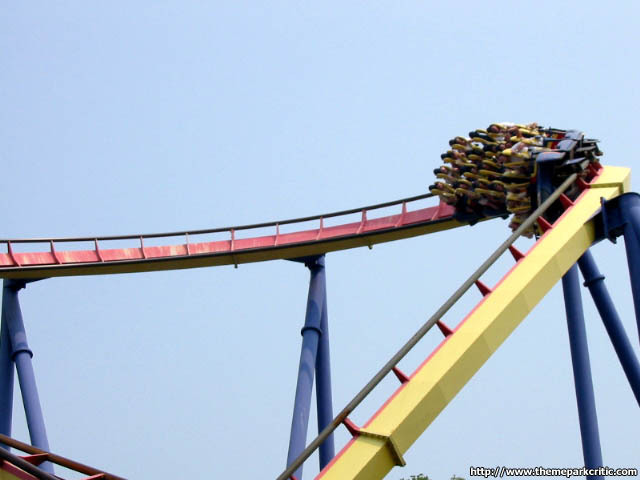 Its slow lift hill builds up your anticipation, and the swooping curve way up in the air is exciting. The first drop would be awesome, but there is a very noticable trim brake on the way down. The loop has really great hangtime at the top and has good g-force. The dive loop and the elevated turn over the station are pretty good too. The tilted loop really doesn't provide any advantage over a normal loop, but it was still a fun element. Pretty much everything after that was horrible, though. It was rough and it hurt. The entire 'maze' idea was pretty bad. Mantis is certtainly a unique coaster and is very forceful but sometimes can be a bit painful, people mention that it bangs your head around.I experienced no such head banging what so ever the coaster was very smooth.The reason why it hurt is because the blood rushed to my feet on almost all of the elements which sort of hurt my feet, this was no fault of the rides though since stand up coasters sometimes do that to me. 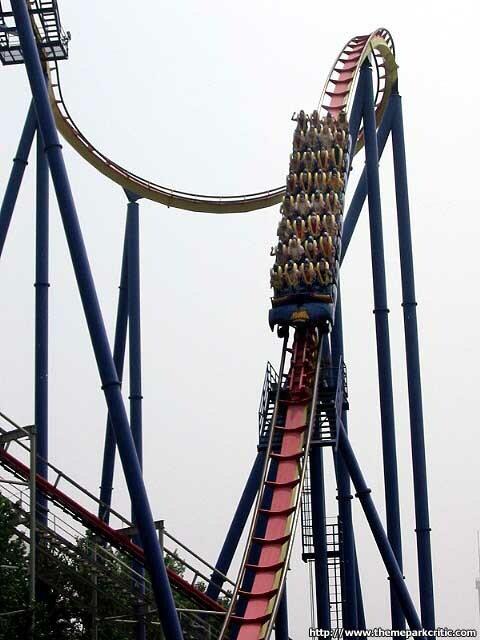 The coasters starts with a slight drop to the right turning and then plummeting and screeching through a trim on the drop, the trim is felt but it felt as though it didn&#39.t affect the speed. The 1st loop was taken at a good speed and really gave you some great hangtime mixed with intense positive G&#39.s. After this came the dive loop which was quite intense, and really gave some great hangtime, then we entered the turn around which provided some more great Positive G&#39.s.The we rushed right into the inclined loop which was very very forceful and was probably the most intense partb of the ride. After this you fly over a hill that banks to the right and goes into the MCBR, the MCRB was on and pinched the coaster slowing it, but it barely made a difference, the we enetered a very intense which we sped through and into a banked turn around after this we flew through more banked twisting turns providing great lateraly G&#39.s and some unique sensations, this is the finale of the ride and soon you hit the brakes. Some people don&#39.t like this ride but I personally didn&#39.t mid it at all, it was much smoother than those pathetic togo stand up so for that the ride sits at an 8. I have only ridden this coaster four times. But I have learned a very valuable lesson about this ride. Its called front seat or no seat! The front seat on Mantis gets a 9 while all other seats will get a 6. I would say that the best part of the ride is right after the lift when the train turns 180 degrees to the big drop. On the outside in the front seat that feeling when your up that high standing up is just awesome. The first 2/3 of the ride is also very exciting. But then comes the bumpy part that everyone talkes about and i&#39;m not going to disagree. In the world of coasters, it is interesting how many different concoctions there are for riding - above the track, below the track, beside the track (a-la X), sitting down, flying, and even standing up! I wonder how long before we are riding a coaster while lying on our backs. Many of these particular types go through booms, as did the stand-ups of the mid 1990s. The pioneer during that time was B&M. Yes, there were other stand-ups tried by the likes of Intamin and TOGO, but the heavy hitters were B&M. 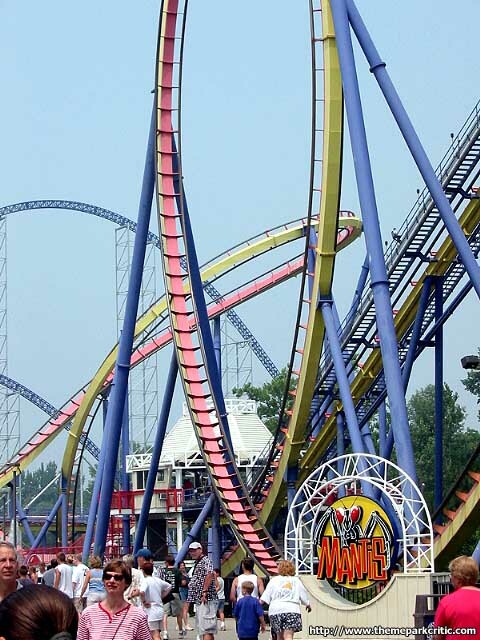 One of their biggest installations of the stand-up genre was Mantis at Cedar Point. Turned out that Mantis ended up being my first (and to this point only) stand-up coaster, and truth be told, I really enjoyed it! Mantis is an interesting creature to look at, especially the baffling second half that is an intertwining, tangled mess of track that is as beautiful as art, albeit a Picasso. The rich colors look great, and the placement partially over that same swampy murk as Iron Dragon works well for the ride. Im not sure if its a typical characteristic of stand-ups, as this is the only one Ive ridden, but this one almost always has a pretty sizable line that moves rather slow. The crew seems pretty good, but there also seems to be plenty of checks that are needed before they can dispatch. So, be prepared for a decent wait, unless you can hit it rather early/late in the day. I will say that the standing position while riding is definitely unique and a pretty cool feeling. Before long, its out of the station and up the impressive lift. Theres a nice little dip and curve off the lift to turn around and also build up a little energy before tackling the first drop, which is very good. On the way down, you can feel an ever so slight hit from a trim brake, but unlike Mean Streak, I actually like the result of this one. You lose very little speed, but just enough to hit the massive vertical loop at the PERFECT speed, producing some amazing hangtime at the top of the loop before plunging back down. The sensations felt here are powerful and intense (and equally great!). Next up the train glides smoothly through a nice dive loop, before executing a high turn and then the very cool inclined loop, which is forceful and fun, along with being something strange to see the first time you look at it. At this point the ride heads into the MCBR, after navigating a first half that is in the upper "9" level, full of thrills and great elements taken at a perfect pace. Well, as you can see, my rating is a bit lower, and thats because the second half just isnt quite as good. That previously mentioned tangled web of track turns out to be almost too ambitious by B&M, and it gets a bit rough in spots. 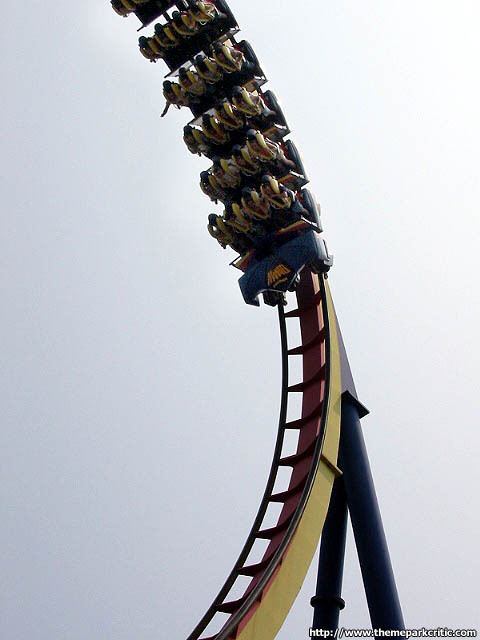 Even the final inversion, a very intense corkscrew, is a bit shaky. Definitely not a deal-breaker, but it seems that Mantis tends to sputter out as it heads into the brakes. The first half is outstanding, and really the highlight of the ride. 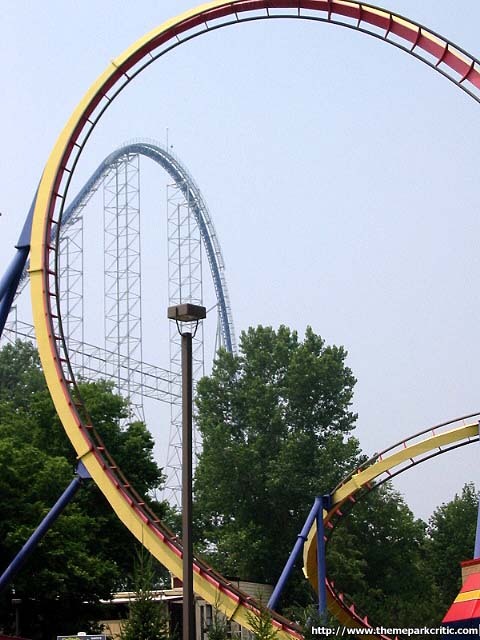 And although the second half isnt bad, maybe another inversion or two thrown into the mix (as opposed to the bending of track in every direction imaginable) would have rounded things out better. 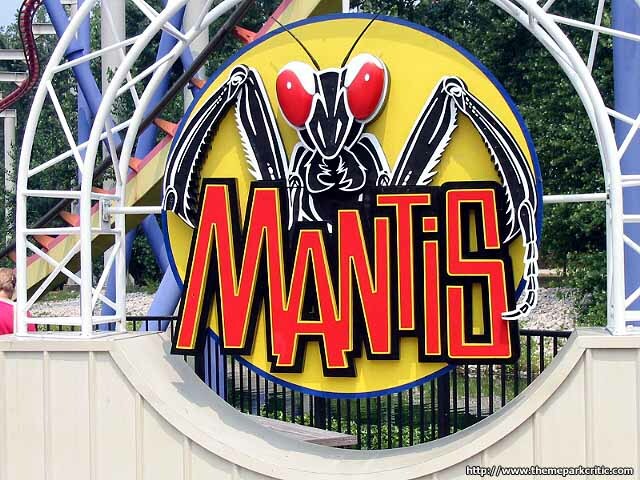 As it is, Mantis still winds up being a great coaster for me, and I found all my rides on it to be fun and enjoyable.